Rainbow Ag is pleased to offer our customers the following loyalty reward programs on our house brand of pet foods. 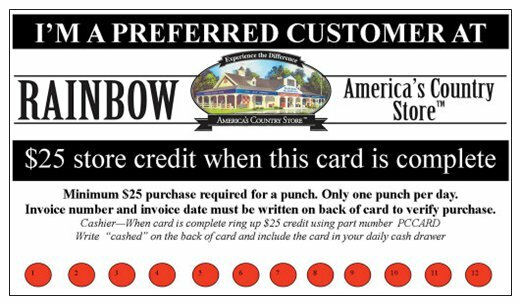 Each time your visit and spend $25 or more, we’ll punch your card. 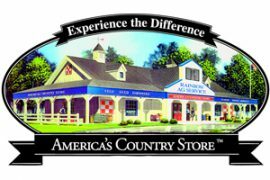 When it’s filled you’ll receive $25 worth of FREE merchandise. Minimum $25 purchase required per punch. 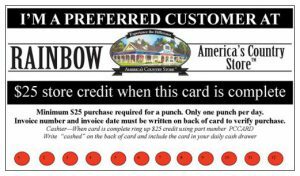 Only 1 punch per purchase per day. This entry was posted on Monday, May 2nd, 2016 at 1:29 pm	and is filed under News, On The Right Lead Newsletter, Rainbow Wags Newsletter. You can follow any responses to this entry through the RSS 2.0 feed. Both comments and pings are currently closed.